Historic Preservation: What's in it for you? We take pride in our secular history, cultural diversity, and democratic traditions. The discovery of adobe structures by construction workers in 2003 and 2004 reiterates the urgency to preserve sites of archaeological and historical significance. The uncovering of these adobes is of keen interest to historians, archeologists, preservation societies, the media and the public, locally and statewide. 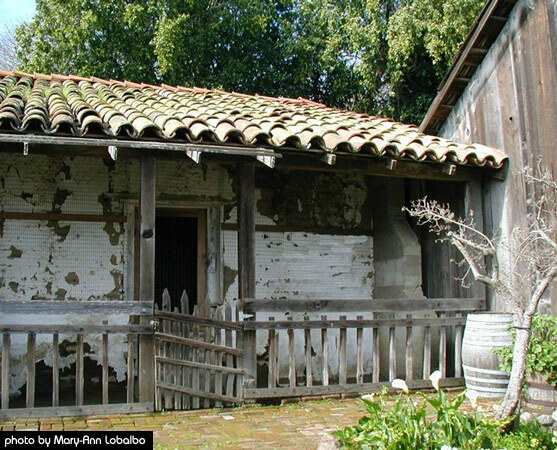 The foundations and the roof tiles of the Perez adobe home were discovered on November 26, 2003. 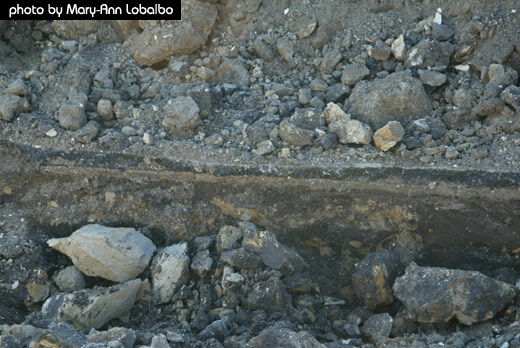 Another adobe structure was found next to the Perez adobe on February 23, 2004. Experts haven't yet confirmed whether this is the foundation of a potentially new adobe or the extension of the Perez home. These adobe foundations are adjacent to a vacant land parcel subject to a proposed two-story 6-unit housing development in 2004. How will significant archaeological and historical features be recognized and preserved, and new housing projects be realized? The Perez adobe foundation has been reburied beneath a concrete sidewalk and part of the asphalt roadway. Despite having been reburied, the Perez adobe foundation could possibly be threatened by trenching for public utilities, which will proceed as part of the proposed development in a Villa de Branciforte neighborhood. Preserving sites of historical significance can be accomplished by the creation of mitigation policies that reduce the risks of destroying or damaging significant archeological remains during the construction of new housing. Preservation does not mean that new housing projects cannot be developed. Every American community with its share of historic buildings, historic homes and neighborhoods, and prehistoric or historic archaeological sites, can offer its citizens an array of attractive tax benefits, as well as access to historic preservation grants and low interest loans. Private property owners, lessees, and public agencies are eligible for various preservation incentives. Investment in historic preservation consistently shows positive returns for income-producing properties, and growth in property values of historic homes. 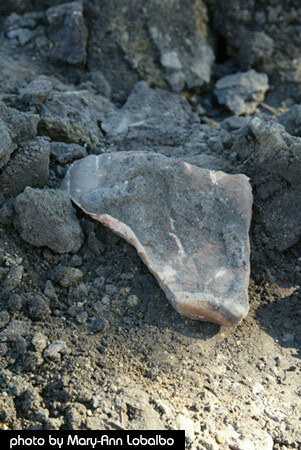 Grant funding may be available for preservation, study and even acquisition of archaeological sites. Low interest loans are available for certified rehabilitation of certified historic structures listed on the National Register of Historic Places, or included within a certified Historic District. Some tax benefits are available with or without formal recognition as a "historic" building: the structure's age alone can qualify its owner for federal investment tax credits. Other incentives are provided directly by State and local governments, and vary by state, community and type of project. The following overview details the historic preservation incentives available to owners and lessees of historic buildings and cultural resources sites in California. The majority of benefits consist of favorable tax incentives for historic preservation rehabilitation by private property owners. These include a 10% investment tax credit on rehabilitation expenditures for any income-producing building constructed before 1936, or a 20% investment tax credit for "certified rehabilitation of certified historic structures" listed on the National Register of Historic Places, or located within a certified Historic District. Public and private property owners of buildings listed on the National Register of Historic Places investing in historic preservation can also qualify for Federal Historic Preservation Grants, on a "funds-available" basis. The State Historic Preservation Officer can assist local governments in becoming certified to participate in this program. Property that is owned by a tax-exempt entity, or governmental body, and that is predominantly used by a long-term lessee (taxpayer) in an unrelated trade or business, which is subject to Federal income tax, is eligible for the rehabilitation tax credits. Thus, if a private sponsor leases a historic building from the city, and then subleases the property to private and/or unrelated public groups, the original lessee can utilize the tax credits as though it owned the building (subject to various restrictions, of course). Investment tax credits for both rehabilitation expenditures and low income housing can be used in combination - the "best deal in town", according to the accounting firm of Sheppard, Mullin, Richter & Hampton. (2) By combining the two, a private property owner or long term lease holder can gain tax write-offs equal to a one time tax credit of 20% of certified rehabilitation costs (on top of normal deductible expenses) plus another 40% write-off over 10 years. Federal Block Grant funds used for restoration of historic buildings can be scheduled more flexibly than for non-historical buildings. The formula that applies to non-historical buildings requires that interior rehabilitation work would account for 60% and the exterior work 40% of the total expenditure. For historic buildings, the City can apply up to 60% for exterior rehabilitation, i.e., to encourage preservation of intricate facades and other architectural features, which are more expensive to restore than in non-historic buildings. Roger DeBaun Owen is principal consultant for R.D. Owen & Associates, a Santa Cruz based consulting firm specialized in integrated science engineering and policy solutions in land use, historic preservation and environmental planning projects. Recently listed in the "Heritage Registry of Who's Who," Roger has more than 25 years experience in land use planning and environmental mediation. His firm has completed numerous projects for U.S. based and foreign corporations, government agencies, interest groups and private property owners. Roger is a member of the advisory committee of the Villa de Branciforte Preservation Society and can be reached at his office at (831) 420-0609 or via email at rogerowen@sbcglobal.net. (1) "Federal Historic Preservation Tax Incentives. Tax Aspects of Historic Preservation Frequently Asked Questions and Answers," Mark Primoli, Internal Revenue Service, National Parks Service, October 29, 2000; "Preservation Tax Incentives for Historic Buildings," National Parks Service, 1987. (2) "Rehabilitation Tax Credits, Easements and Other Preservation Incentives," William F. Delvac, Sheppard, Mullin, Richter & Hampton, Proceedings of 1987 Rural Preservation Conference, Hanford, California, October 15, 1987. (3) "Mills Act Property Tax Abatement Program," California Office of Historic Preservation, Technical Assistance Series, Article 12, Office of Historic Preservation, March 1, 2000. (4) "Incentives Program for Historic Preservation," Vincent Marsh, Preservation Officer, City of Sacramento, California, 2000. (5) "California Historic Building Code," 1998 Edition, Published by the International Conference of Building Officials, May 1, 1998. "National Historic Preservation Act of 1965," Public Law 89-665, STAT., 915 U.S.C. 470, as amended by Public Law 91-243, Public Law 94-458, Public Law 96-199, Public Law 96-244 and Public Law 96-515. "Protection of Historic Properties" (36 CFR Part 800), Federal register, Vol. 51, No. 169, September 1986. National Register of Historic Places (36 CFR Part 60). National Register of Historic Places (36 CFR Parts 60 and 63), Proposed rule, Federal Register, Vol. 51, No. 150, August 5, 1986. "Curation of Federally-Owned and Administered Archaeological collections" (43 CFR Part 7), Federal Register, Vol. 43, No. 4, January 6, 1984. "CEQA: California Environmental Quality Act Statutes and Guidelines," Office of Planning and research, Office of Permit Assistance, Sacramento, California, 1986. California Health and Safety Code, Section 7050.5. California Public Resource Code, Section 5097. When residents feel the special character of their neighborhood is threatened, there are three formats available for the protection or improvement of a neighborhood's traditional character: Historic District; Historic Conservation District; Neighborhood Guidelines. With each of these formats, neighborhood workshops can help determine elements regarded as most important to this specific area for guidelines. An Historic District requires a cluster of landmarks listed on either a local Historic Buildings Inventory, a State Landmarks Directory, or the National Register for Historic Places. By defining the style-or-styles this group of structures represents, guidelines are created to require new in-fill development to be compatible with adjacent styles, scale (height limits, set-backs), and the density of neighborhood. Street-scape guidelines can include if desired, so that Public Works improvements such as lamp-posts, sidewalks, street trees, etc., also compliment the defined character of the neighborhood. Existing Regulations: An historic listing protects the primary façade(s) visible from specified locations (usually from the street, and sometimes from an important vista). Changes not noticeable from those locations (such as interior structural changes or additions to secondary facades or rear sections) are generally allowed, but must go through historic review historic review for compatibility of design or materials. Listed landmarks must avoid substituting inappropriate materials that diminished their property's historic look. (This mostly means avoiding vinal windows and rain gutters, exposed-aluminum window-casing or pop-in pane-dividers, Sears metal-grapevine porches, etc.) Minor items such as these can usually be reviewed at the planning counter without a commission hearing. Non-historic homes in an Historic District and new construction can use modern materials and follow normal remodeling, expansion, and development procedures, with the provision that plans submitted to the Planning Department be reviewed for compatibility with the defined aesthetic and scale of the Historic District. This is a lesser Historic District category, for when there is either not a sufficient number of listed landmarks to constitute an historic district, or when the older building stock is collectively notable, but not individually distinguished. The guidelines are more to maintain or improve the general integrity of the neighborhood. Lost or Altered: This classification may also be appropriate for areas of historic importance that are missing many of their original landmarks, or whose historic building stock has been inappropriately modernized. The term "Historic Resource" is sometimes used to identify altered landmarks that are prime candidates for restoration, but that do not presently meet landmark standards. So in the case of lost or altered landmarks, an Historic Overlay District might be regarded as a Starter District, to bring back the ambiance of an important area, or restore buildings that would normally not qualify for consideration. If carried out in an appropriate manner, an Historic Resource can be upgraded to a Landmark, and an Historic Overlay District can be upgraded to an Historic District. A third form of neighborhood protection is establishing guidelines for a specifically defined Planning District. These have been used for historic areas, non-historic neighborhoods, and even new communities wishing to hold to specific aesthetic and development ideals. Unlike the other two districts, this is managed by a Planning or Zoning Commission. However, listed historic properties within this district will still be subject to review by an Historic Commission, the same as before this planning district was established. One drawback to excluding an Historic Commission from review in this planning district, is that Planning and Zoning Commissions do not necessarily need aesthetic or design expertise to apply their regulations, leading to disputes over what exactly constitutes aesthetic compatibility? An Historic Commission is the only body exclusively focused on aesthetic compatibility issues. To do without this expertise, the guidelines must be quite specific in what is and is not appropriate. Ross Eric Gibson is a historic architectural consultant, and historian specialized in the Santa Cruz history. Ross Eric is a member of the City of Santa Cruz Historic Preservation Commission, and has been advising the City of Santa Cruz on several issues related to historic preservation. He is currently working on the compilation of an extensive study about the homes and early inhabitants of the Branciforte Avenue in Santa Cruz. Ross Eric is a member of the advisory committee of the Villa de Branciforte Preservation Society. © Copyright 2003 by Ross Eric Gibson. The Villa de Branciforte Preservation Society was granted permission to reprint this article. Permission from the author is mandatory for any reprints.